ABSTRACT: For decades, scholars have attributed Black Americans’ unified political and policy views, despite growing internal class and status differences, to a strong perception of linked fate. In recent years, the concept has been measured in other racial and ethnic groups and with regard to gender, but not applied to social statuses such as class or religion. Without broad comparisons across groups and different statuses, however, one cannot determine the appropriate empirical test or most distinctive correlates of this canonical construct. Using a new national survey, we examine Americans’ views of linked fate by race or ethnicity, and also by gender, class, or religion. 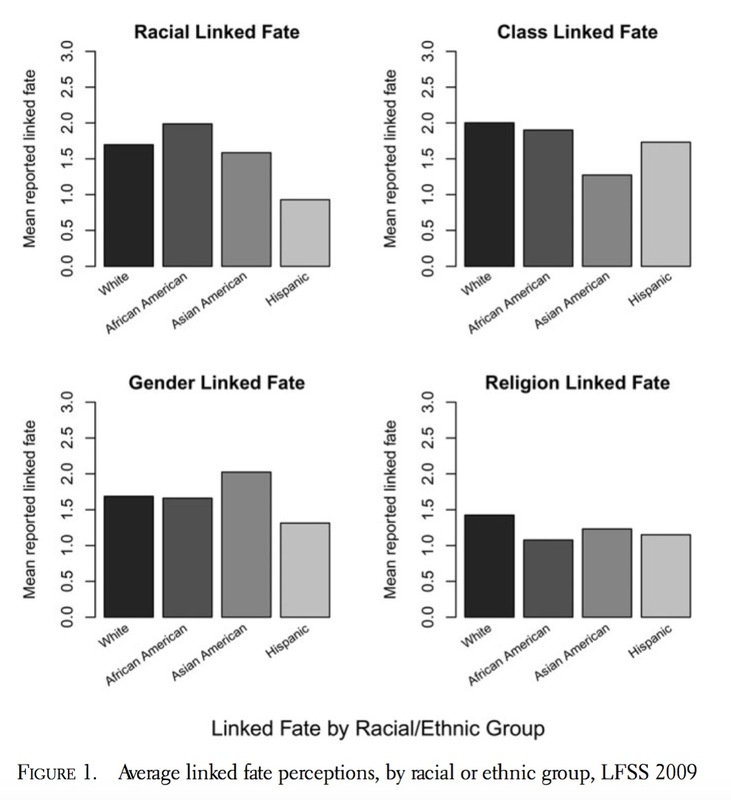 We find expressions of linked fate to be similar across racial or ethnic groups, robust to experimental manipulation, and as strong for class as for racial or ethnic identity. Intra-individual correlations on linked fate items are very high, while a sense of linked fate is rarely associated with political views or political participation. Expressions of linked fate are not always closely related to feelings of closeness to one’s group or perceptions of discrimination against that group. We speculate on the broader meaning of responses to this standard item, and conclude that the enormously fruitful theory of racial linked fate is due for further conceptual development and empirical experimentation. CITATION: Gay, Claudine, Jennifer Hochschild, and Ariel White. 2016. 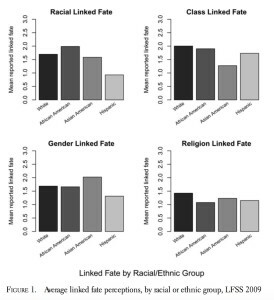 “Americans’ Belief in Linked Fate: Does the Measure Capture the Concept?” Journal of Race, Ethnicity, and Politics 1 (01): 117–44.